As a Catholic fan of the Hunger Games, I can’t help but wonder if author Suzanne Collins was inspired by Saint Maximilian Kolbe to have Katniss take her sister Prim’s place in the 74th Games. This is the story of Saint Maximilian Maria Kolbe! There once was a boy named Raymund, who was born in Zduńska Wola, Poland with his father Julius, his mother Maria and four brothers. Not long after he was born, Raymund and his family moved to another town called Pabianice. Raymund was an aimless boy; he went to school, helped out around the house, walked around town, etc. He didn’t seem to have any particular talents that would make him famous or important by the world’s standards. Then in 1906, the Virgin Mary appeared to him in an apparition that would change the course of his life forever. Raymund joined the Conventual Franciscan minor seminary with his older brother Francis one year later. Then in 1910, Raymund Kolbe entered the novitiate with a new name: Maximilian. Now Maximilian and the Virgin Mary were BFFs. After all, she saved him from a dull life as a directionless country boy by revealing his purpose in life. Naturally whenever someone impacts your life in a positive way, you feel a desire to repay them and show your gratitude. In Maximilian’s case, he felt so much love and respect for the Blessed Mother that he not only added “Maria” to his full name (Maximilian Maria Kolbe), not only did he openly promote the veneration of Mary, but he even started the Militia Immaculata (MI) in her honor. The purpose of MI is to evangelize to the world and convert hearts by relying on Mary’s intercession. In fact, to become a member of MI, you have to make a personal act of consecration to Mama Mary. Yep, that’s the sexist Catholic Church; we’re so misogynistic that we canonized a guy who was inspired by a woman to change his life and then started an organization where members consecrate themselves to that same woman. Maximilian’s missionary work took him all over the world; China, Japan, and eventually to India. For reasons unknown, he couldn’t gather a following in China, but he did get a lot of work done in Japan. He build a monastery on the outskirts of Nagasaki. Interesting trivia: The atomic bomb that was dropped on Hiroshima and Nagasaki obliterated everything in its path…except for the monastery that Maximilian had built. In the midst of death and destruction, the monastery was still standing. Even when tuberculosis forced him to end his travels and return to Poland, Maximilian remained active by starting a radio station in–(do not ask me how to pronounce this) Niepokalanow. Then everything changed when the Fire Nation–I mean–the Nazis attacked. In addition to slaughtering innocent Jews, the Third Reich had a particular hatred of the Catholic Church and anyone associated with her (I say “her” because the Church is the bride of Christ). 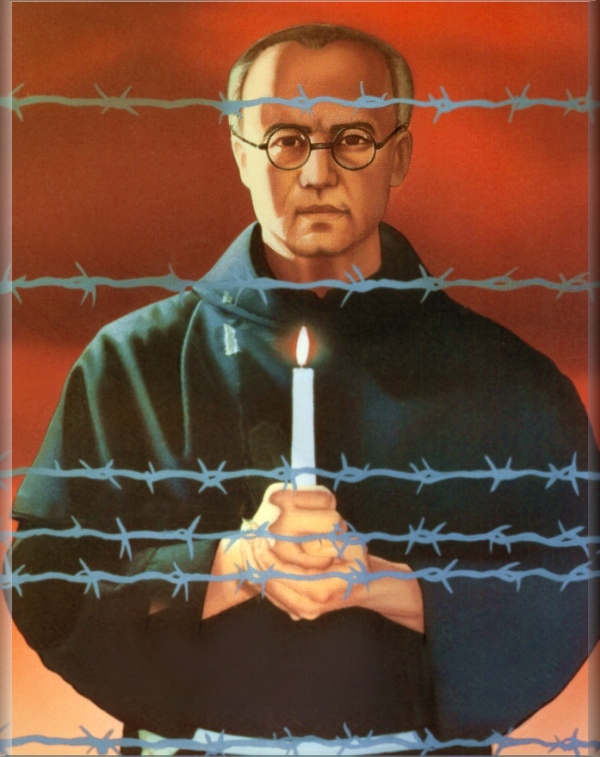 Maximilian and four other priests were arrested on Feburary 17th, 1941. When Maximilian was sent to Auschwitz, he was given another new name: Prisoner #16670. One of the twisted policies of Auschwitz was that if a prisoner escaped, ten prisoners would pay with their lives. So when three prisoners fled Auschwitz, ten men were randomly selected to spend their days in an underground bunker, where they would left to die from starvation and dehydration. One of the chosen was Prisoner #26273, also known as Franciszek Gajowniczek. In a panic, Franciszek cried out, “My wife! My children!” Haunted by the fear of leaving his wife to fend for herself with two fatherless child, he begged for mercy. The Gestapo officers held their batons, ready to strike him to end his pleading. A man with glasses and a long white beard stepped up and faced the Gestapo. The switch was made and Franciszek was sent back in line to live another day. Wiping off the sweat from his face, he turned to get a look at his rescuer, Father Maximilian Maria Kolbe. During his final days, Maximilian kept his fellow prisoners in high spirits with prayer and fasting. He evangelized to the men, giving them hope by telling them of Jesus and His mother Mary and praying with them. Two weeks later, the guards entered the bunker to collect the bodies. They froze when Maximilian Kolbe looked up at them, still alive. A calm Maximilian lifted his left arm and received a deadly injection of carbolic acid. His body was cremated on August 15th, the feast day of the Assumption of his beloved friend, Mary. Saint Maximilian Maria Kolbe, pray for us.